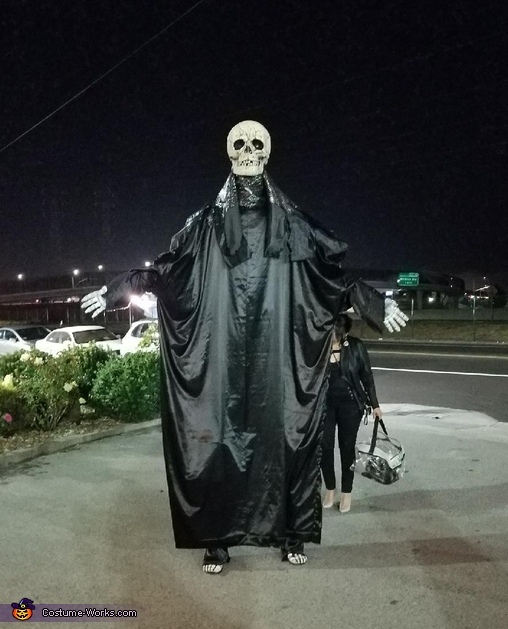 My friend Arthur created and is wearing the Giant Skeletor costume. The idea came from a nightmare he had. Art is walking on a pair of stilts. His costume is made from large pieces of fabric sewn together. He also used football pads on his shoulders to give him a wider stature. The skeleton head is made from a hollowed out decorative skeleton head. Color changing laser lights were placed in each eye hole. Halloween is Art's favorite holiday- since it's also his birthday!